Who says you can't have it all? Not fans of Sandpoint, Idaho. The small town, with a population of about 8,000, has won accolades as a retirement hot spot, an outdoor sports mecca, even one of the top 10 cities for telecommuting. It serves as the national headquarters for several notable companies, including Coldwater Creek apparel, attracting a young, vibrant workforce and fueling the local economy. So what's the big appeal? A combination of stunning natural beauty, excellent year-round outdoor activities and a surprising wealth of art and cultural offerings. Sandpoint is located in the Panhandle of northern Idaho and sits directly on 43-mile-long Lake Pend Oreille (pronounced "pond-uh-ray"). Though winters are typically cold and snowy, the summer months are marked by long strings of warm, sunny days. The Selkirk and Cabinet mountains overlook the town, offering options for hiking, climbing and mountain biking. The Schweitzer Mountain resort, 12 miles away, spans almost 3,000 skiable acres with 92 trails. Both visual artists and performers make their homes here, and Sandpoint offers a lot of live music. In addition to regularly scheduled art exhibits and art walks, the town is host to one of the largest film festivals in the Northwest, and a major 11-day summer music festival attracts big names. The Panhandle also is popular for golfers, and outside Sandpoint is a high-profile private golf club, the Idaho Club. There is a public course on nearby Priest Lake, two nationally ranked public courses and two more high-end private clubs around Coeur d'Alene, less than 50 miles away. Another popular second-home community on a large lake, Coeur d'Alene offers additional dining, cultural and recreational options to Sandpoint buyers. "With 111 miles of shoreline, (Sandpoint's Lake Pend Oreille) is considerably bigger than Lake Coeur d'Alene, but there is far less traffic. You often feel like you're alone out there," says Patrick Werry, a real estate agent with Century 21 Riverstone. "There is a large variety of second homes around Sandpoint. You can find anything from a 900-square-foot house for $220,000 to a 5,000-square-foot home on the lake for $2.5 million. We have two main options, on the lake or at the ski resort." • Sandpoint. Realtor Patrick Werry says second-home buyers in town are choosing lakefront property, usually in one of two enclaves. Dover Bay sits just outside town, with cottages from under $230,000 to luxury condos for more than $1 million. 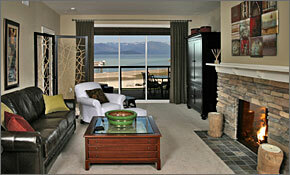 Seasons is the main lakefront condo development within Sandpoint, a short walk to downtown shopping and dining. "It's all new, nothing more than 5 years old and they are still building, with their own fitness center and spa, on the water but close to everything. Prices range from $500,000 to $2.5 million." • Hope. About 20 minutes outside Sandpoint, this small, lakefront community is surrounded by state-owned protected wilderness. "No large developments, just single-family homes for resale," Werry says. "Homes on the water run $500,000 to $2 million, and off the water, $190,000 to $450,000. It attracts those interested in boating and is definitely a second-home spot for summer, very slow in winter." • Schweitzer Mountain Resort. "The vast majority are second homes. There are about 700 homes and condos and only 70 full-time residents," says Werry. "There's a wide range, $100,000 to $1 million, and the newest option is fractional ownership, $195,000 for four weeks in a nice, new three-bedroom. 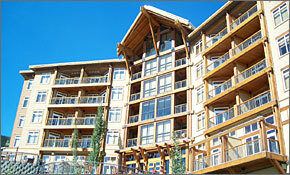 There is a lot of ski-in/out property, plus condos in the main village and single-family homes a mile away." The resort offers summer mountain biking, hiking and an equestrian center. This ski-in/ski-out condo is on the top floor of the White Pine building in Schweitzer Village, with contemporary architecture and views of Lake Pend Oreille. Features: Sold fully furnished with great room, gas fireplace, deck with lake views, underground parking. Building has hot tubs, ski storage, fitness center and tennis courts. This corner condo is in the Seasons community in downtown Sandpoint, on the waterfront. Features: Gourmet kitchen with custom cabinets, stainless steel appliances, breakfast bar and walk-in pantry, living room with gas fireplace, laundry room, balcony with lake view, one-car garage. Community has private marina, pool, hot tub, exercise room, clubhouse and day spa.